ANYA ADORES: Something for the weekend!! The Mr. has developed a certain knack for baking, far surpassing my skills. He is the king of Lemon Meringue Pie, and as this is good enough to eat (a lot of) I have decided to share it with you. The perfect Easter Recipe - yellow, white and just gorgeous. *Mix everything, get it to connect and then add the egg yolk last. *Mix the water, sugar and cornflower with the lemon juice, over medium heat. Keep stirring till a thick paste. Take of the heat, add butter & lemon rind. Then add the 3 egg yolks, mix it in, and leave to cool. *Whisk eggwhites until white and glossy, and then add the sugar. *Put in the oven 200 degrees celsius and bake until the peaks go slightly golden. Leave to set and cool. ENJOY!!! This recipe is the perfect one for a hyggelig afternoon indulging! And do share how yours turned out. Yummi, dear Anya, that´s what I like. I really have to try this. 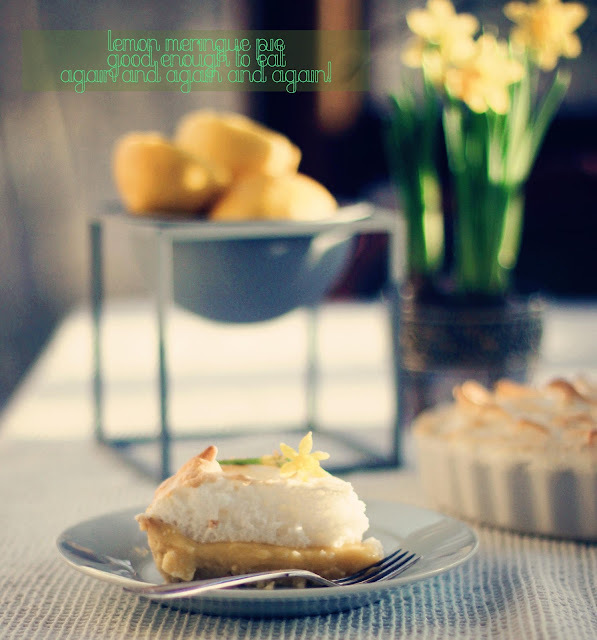 Anya, I love lemon meringue pie and this looks sooo good! loved all your Easter posts, hope you had fun today. The cake looks so fluffy and pretty, I love your photo of it with the little daffidol to decorate!